Teenager's Start-Up Tests A High-Tech Way To 'Read' Mammograms In Afghanistan : Goats and Soda Abu Qader came to the U.S. from Afghanistan when he was a baby. He wants to use his technology know-how to help the women of his birthplace. 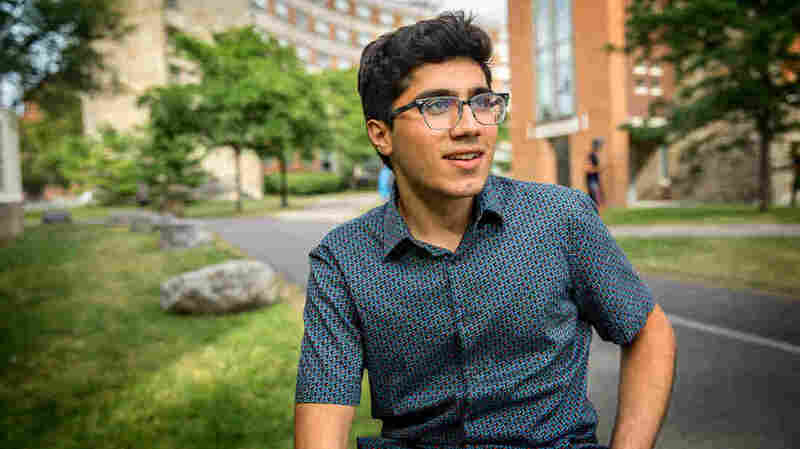 Abu Qader, 18, came to the U.S. from Afghanistan as a baby. Now a freshman at Cornell University, he has founded a medical technology company with the goal of improving diagnosis of breast cancer in poor countries. After a family trip to Afghanistan when he was 15, Chicagoan Abu Qader decided he wanted to do something to improve the country's medical care. "I knew and saw people and friends and relatives in Afghanistan whose breast cancer wasn't diagnosed, and it was fatal," he said. He further noted that the country's health care system is weak, with a high prevalence of breast cancer and limited options for care. He decided, "I wanted to build something that would help." Now 18, a Cornell University freshman, and co-founder of the medical-technology company GliaLab, he is seeking to fulfill that ambition. What Qader has built is a computer program that uses artificial intelligence, reams of biomedical data and various algorithms to essentially "read" mammogram images, spotting and diagnosing abnormalities quickly and at low cost — a potential boon to developing countries, where access to doctors and health care can be limited. The technology is still in the testing stage, says Qader. Qader acknowledges that interpreting mammograms is usually the task of radiologists, but his goal is not to replace human physicians, he says, but to help them — particularly in areas, often in low-income countries like Afghanistan, where trained physicians can be scarce. Qader believes his technology can aid doctors by quickly pinpointing diagnoses to allow for earlier and better care. Although there are mammogram machines in Afghanistan there are not enough skilled doctors to read the results, he says. "They have the hardware — it's only getting cheaper — but not the manpower." "Abu's project uses machine learning technologies to make computers recognize patterns in the imaging data that have diagnostic value," explains Mert Sabuncu, assistant professor at Cornell's School of Electrical and Computer Engineering, in an email. "He achieves this by showing the algorithms a lot of examples of cases where a diagnosis has been confirmed ... I think this direction has a great potential and I'm confident Abu and his team can make an impact." He's not the only one who thinks so. After meeting Qader at Google's I/O developer conference in May 2017, Google CEO Sundar Pichai and chairman Eric Schmidt sent him Twitter shout-outs. Qader also presented a TEDxTeen talk in London about his quest to apply machine-learning technology to health care in the developing world: "How I Searched My Way to a Cure." Abu Qader, a freshman at Cornell University, has created technology to aid in the diagnoses of breast cancer. Dr. Susan Harvey, director of breast imaging at Johns Hopkins Medicine, says that, "Based on my knowledge of the research, this is very exciting and it sounds like it's possible." But she adds a cautionary note: "Like when NASA said we're going to get to the moon, it didn't happen overnight, it took a decade. The same for this, it looks feasible but it won't happen tomorrow." In addition, she says, when trying to introduce such projects in a low-resource country, it's important to "make sure that the technology can be successfully implemented, that there is a match-up between the resources available and the technologies proposed." Even though his project has received a lot of attention, Qader is still a "regular guy," says his Cornell classmate Ella King, a freshman from Lenox, Massachusetts. "He doesn't just work and study all the time. Sometimes we like to take a break and take a walk" and engage in conversations that range from the "science-y" to philosophy," says King. "He's pretty much authentic as they come," says Jess Teutonico, executive director of the We Are Family Foundation, the nonprofit that sponsors the TEDxTeen program. "He's super-smart, but if you peel back another layer you see the story of his family." It's the story of an immigrant family seeking the American dream and of a kid whose curiosity led him to become a budding entrepreneur. Qader was born in Afghanistan in 1999 and came to Chicago with his parents when he was only a few months old. He grew up surrounded by aunts, uncles and cousins, all of them, he says, "trying to figure out" how to make new lives in their new country. A key ingredient, his family taught him, was helping people: "If we were in the position that we could help ourselves, we could help others. That is the philosophy I grew up with and that has always helped me." "This is how he is," says his mother, Roya Qader. He returned from their family trip to Afghanistan asking, "Why people there don't have the opportunities that he had to study. And what could he do to help people there?" Helping people has become his guiding principle, he says. In addition to his work on breast cancer diagnosis, he's part of an engineering project team at Cornell centered on building self-flying airplanes. The project attracted him, he says, "because this can be applied to help people" by dousing forest fires from above, for example, as opposed to sending firefighters into dangerous conflagrations. Plus, he admits, things that fly have always attracted him — an observation his mother can attest to. "He always had helicopter sets, and all the toys I bought for him he would unscrew them to see what's inside, how do they work," she says. "I would ask, how come you broke this apart? And he would say, I just wanted to see how it was made!" At around the same time — about age 7 — Qader set out to read the first volumes of a Scholastic encyclopedia set. "It was Google before I knew what that was! I thought if I read it all I would know everything," he says. His achievements to the contrary, he denies that he's a genius. "I try to peer into things and figure out how they work and visualize the connections," he says. That's how he went about developing the software for his breast cancer diagnosis project. His first step was looking up the phrase "machine learning" online and proceeding to teach himself everything he could about artificial intelligence. "And," he says, "I'm still learning."